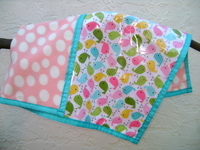 Weather-proof baby blanket with pretty bird fabric with light blue trim. 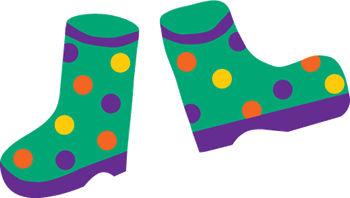 Pink polka-dotted fleece or lime green fleece on the inside. Outer fabric is highly water resistant fabric that keeps rain and snow off, so your baby can stay dry and warm when they are outdoors. 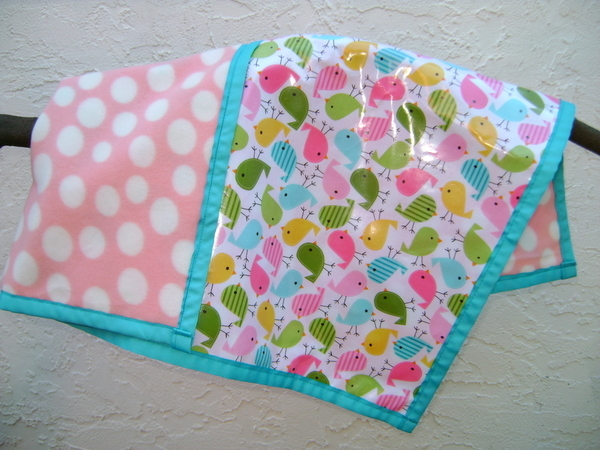 •	Double-sided blanket with print on outside and anti-pill fleece on inside. •	BPA-free laminated cotton fabric keeps water away from baby. •	Surface wipes clean with a damp cloth or disposable wipe. •	Sewn-on strap can attach to a five-point harness that keeps blanket in place. •	Machine wash cold and line dry. •	Designed to drape over sides of stroller so rain rolls off like an umbrella. •	Multiple uses. 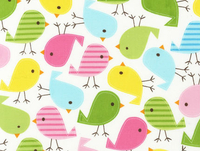 Can also be used for a diaper changing pad, ground cloth, or splat mat. •	BPA-free. lead-free, phthalate-free fabrics. Wash in cold water on gentle cycle.